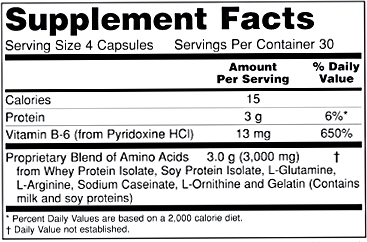 SUGGESTED USAGE: As a dietary supplement, take 4 capsules 1-3 times daily with or between meals, preferably with juice. (For sleep disorder, anxiety, phobias, brain, mind, cognitive function) This proprietary blend of neuromodulating specific amino acids and other nutrients supports optimal mental functions. These nutrients also provide neuroprotective action important for maintaining brain cell health and optimal cognitive ability. Some may also need Brain Food, Brain Igniter, Neuro Balancer or other brain nutrients to achieve desired recovery. No preservatives or sugars, yeast, starch, corn, wheat, soy or milk added. © 2019 FaithandFamilyNutrition.com. All rights reserved.